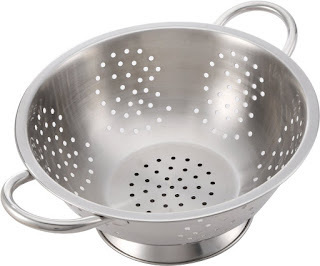 Whether draining pasta or hamburger, or washing your veggies, the Stainless Steel Colander for Kitchen Food Washing Self-Draining Pasta Bowl Wide Grip Handles is another must have kitchen tool. This 3 quart colander measures 9 inch diameter and is large enough to wash and prepare my fresh veggies that I have been harvesting from my garden. It also works perfectly for draining my pasta for making spaghetti, macaroni or other noodles. It is made of stainless steel so I never need to worry about draining hot liquids in it. It works well for straining hot grease from hamburger, water from veggies or pasta, or any draining needs. Because this is made from stainless steel, it is solid and sturdy. The base is stable so the colander does not tip at all. The stainless steel surface means that I don't need to worry about rust, and it is easy to clean since it is dishwasher safe or can be washed by hand in a sink full of hot, soapy water. Although I was offered this product at a discount or received a complimentary sample in exchange for my fair and honest review, all thoughts and opinions on the products I review are always my own and have not been influenced by any discounts or samples which may have been provided to me for testing purposes. Questions and comments are welcomed.